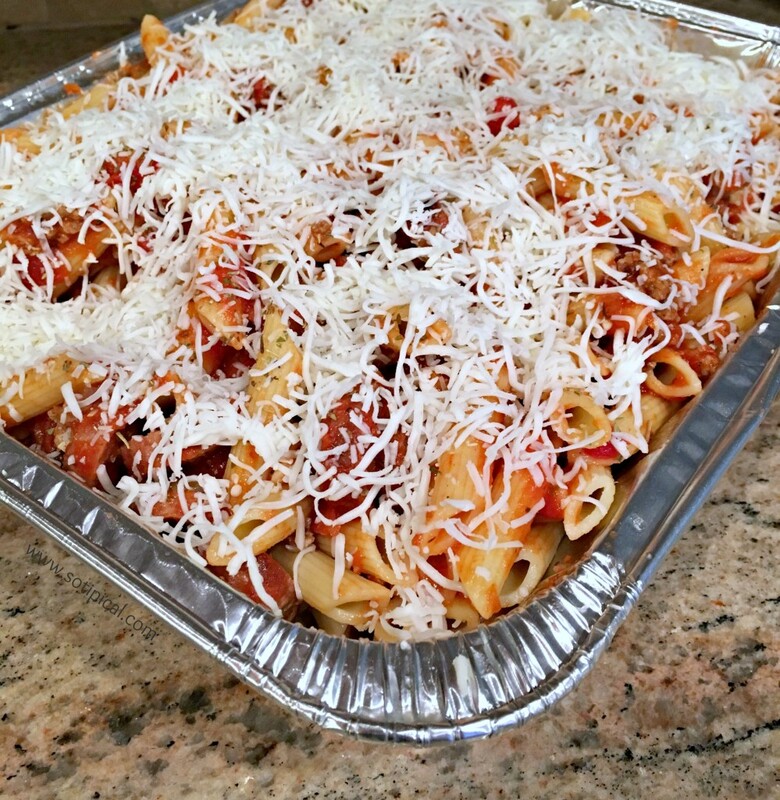 Cooking for a crowd is easier than you think with this make ahead baked ziti recipe! It is one of my go-to recipes when I am going to a potluck, entertaining a crowd or even bringing a meal to a friend. I love that I can prepare the whole thing in advance and pop it in the fridge until I’m ready to heat it up. During the holidays, we often attend potlucks and gatherings where we each bring a hot dish to share. Baked ziti is always a hit and the first one to run out! Last week I was part of a group supplying dinner for about 25 adults. It just so happened that my assigned day was the busiest day I would have all week! The beauty of baked ziti is that I could prepare it in the morning, deliver it in the afternoon and serve it in the evening. I didn’t have to spend a couple of hours before dinnertime trying to get that done, plus our dinner at home and everything else I had going on that day. 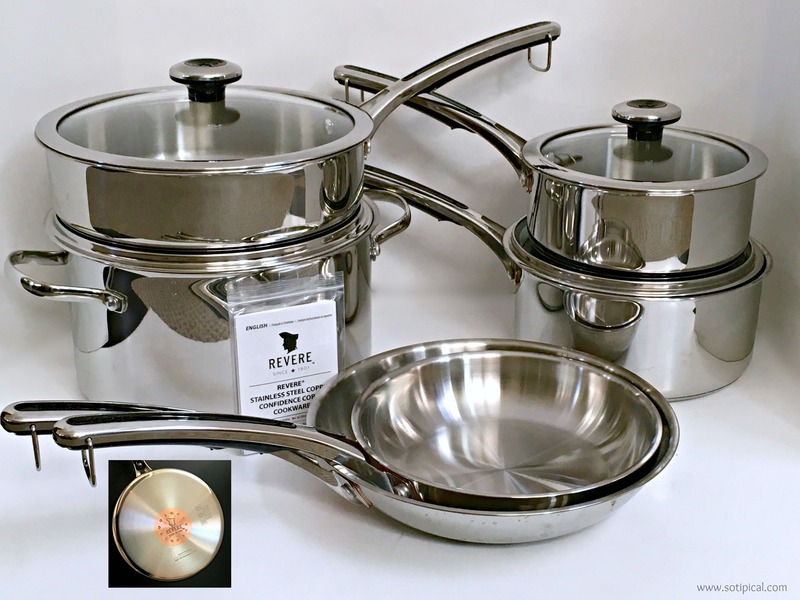 I had recently received my new 10-piece set of stainless cookware by REVERE® with the Copper Confidence Core™! You remember REVERE®, right? They’ve been around a long time and both my mom and my grandma had REVEREware! Well I couldn’t wait to try them out! Begin by preparing ziti pasta, according to directions. 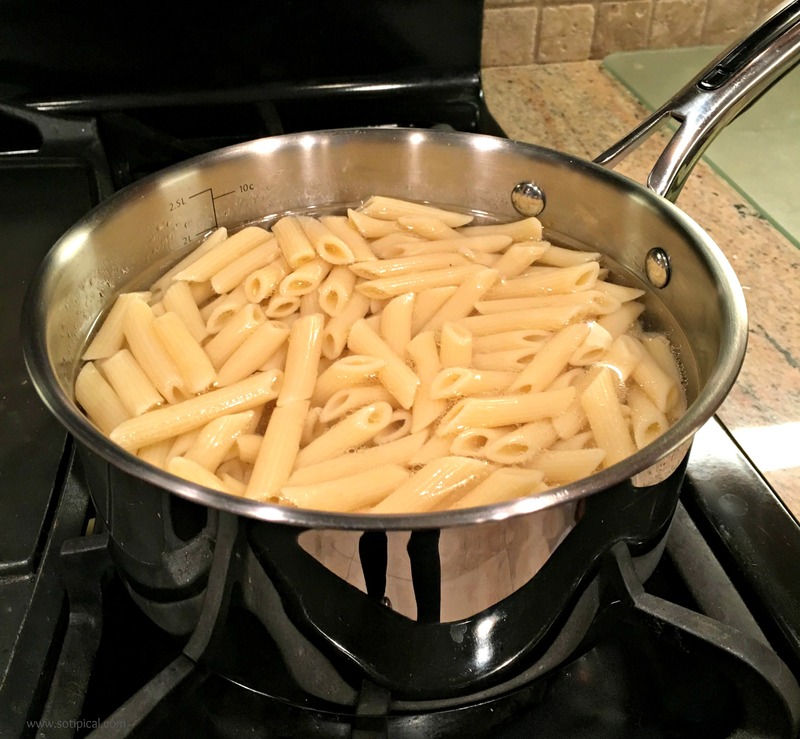 While the pasta is cooking, place a large skillet over medium heat, lightly coated in olive oil. Brown your ground beef or turkey and add the minced garlic and Italian seasoning, midway through the cooking. Now is when you will also add salt and pepper, to taste. Once browned, drain any excess fat and add the pasta sauce. Heat thoroughly, stirring occasionally over medium-low heat. Drain pasta when done, then mix about 1/2 cup of pasta sauce into the pasta to prevent sticking. 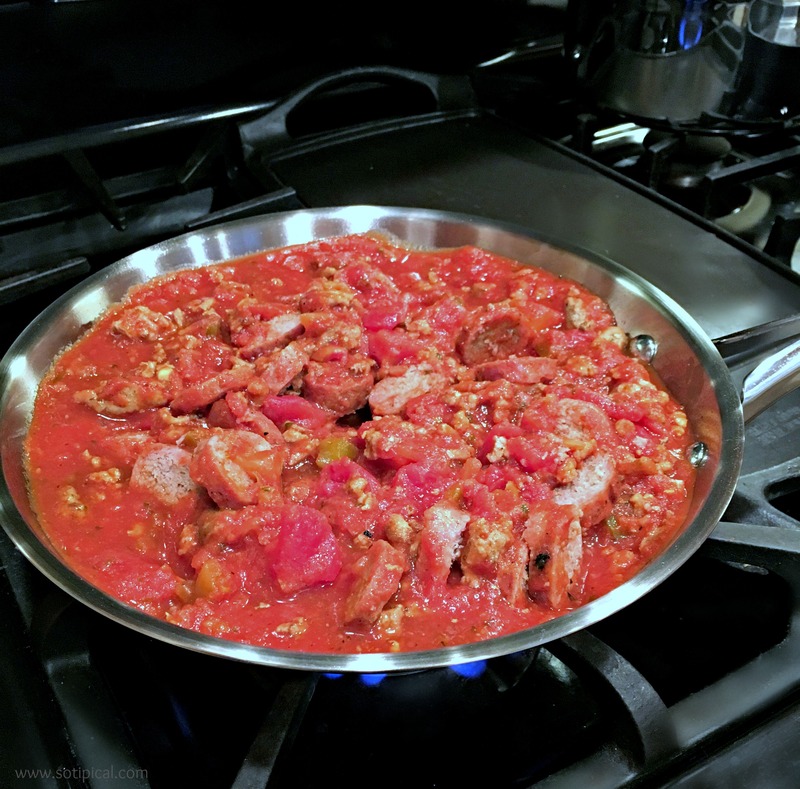 Lightly spray the inside of your pan, then a very thin coating of pasta sauce on the bottom. Now you have two options. If you like, mix in the remaining meat sauce to your pasta, then place the baked ziti mixture in the baking pan. Another option is to add some of the sauce to the pasta, transfer to the baking pan and top it with the remaining meat sauce. Either way is fine, its your preference. Next you will add scattered spoonfuls of ricotta, if you are choosing to use it. I like this option because it reminds me of lasagna. YUM! Add shredded mozzarella to the top. When ready to bake, preheat oven to 350 degrees and heat for about 30 minutes. Serve with a salad and garlic bread. Baked Ziti is a super easy make ahead meal! Now of course I have made my own pasta sauce, which is super yummy, and you can too. But, sometimes I just don’t have the time to spend doing that, so I like to have some semi-homemade tricks up my sleeve to save time. I actually made one with meat sauce and one with marinara and ricotta. I needed to have a meatless option for the crowd we cooked for. You can customize this any way you like. Add veggies, layer it, whatever you like! For convenience, I like to keep these ingredients on hand most of the time, just to be prepared. Its also an easy meal when you haven’t planned dinner. 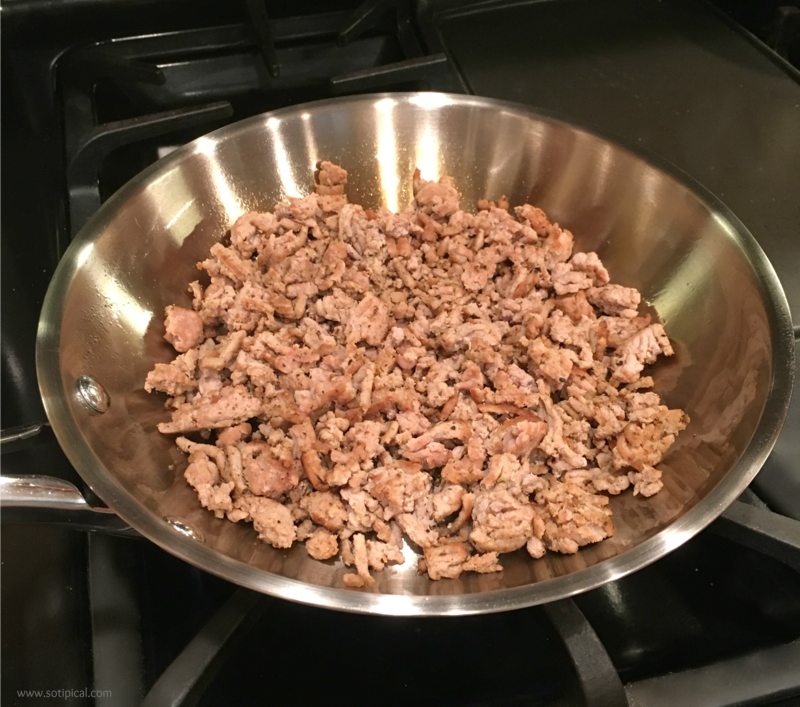 I buy ground turkey in bulk and will usually cook it all when I get home. Then I divide it and freeze the cooked meat in quart sized freezer bags. This way, I can just quickly defrost one for a quick and easy meal like this! 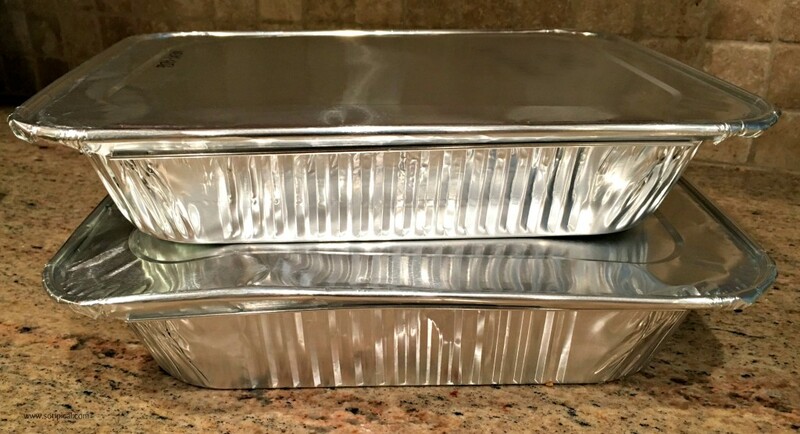 *Aluminum pans with lids is something else I keep on hand so that when I do deliver a meal, I don’t have to worry about going back for my pan. This is another item I buy in bulk about once per year. And there is my super quick and easy (make-ahead) Baked Ziti recipe! If you have any unique twists on baked ziti, please share them in the comments! Now, back to my REVERE® pans! They were so easy to use and store well too. This new REVERE® cookware also features the patent pending Nest & Protect™ interlocking handles. Pots and pans store efficiently, seemingly floating above each other, without touching or scratching the interior or exterior surfaces. It is available for purchase at Amazon.com and ShopWorldKitchen.com. My kids are loving these pans too. They love to make this stove top POPCORN . It is even more fun with a clear lid because they can see the popcorn popping! So how would you like to win a starter set of the REVERE® Copper Confidence Core™ 2-pc Stainless Steel Medium Frying Pan Starter Set? This set includes: (1) 8 inch fry pan & (1) 10 inch fry pan. Disclosure: This post was sponsored by World Kitchen LLC and may contain affiliate links. All opinions are 100% my own. I have to admit, I love the nesting feature. There is just never enough space in the cupboards for all the pans I want to have within easy reach. Oven Safe! I make a ton of one pot meals that start on the stove but finish in the oven. Not having to transfer into something oven safe is key for me! Yes, it is very helpful. Less clean up is always a bonus for me! Yes! The interlocking handle are working out well. Everything stays put! Those look so neat! I’m a sucker for saute pans, plus I love the glass lids. Quick heating and cool handles- I have a toddler at home !! This recipe looks DELIS! I entered to win!! I love that it is dishwasher safe! Easy clean up. the patent pending Nest & Protect™ interlocking handles. Quick Measure Marks – Laser-engraved easy reference measurement marks included in sauce pans, stock pots and Dutch ovens. I like the interlocking handles, but the copper core is great for even cooking! I love the nesting feature! Stacking them without scratching, now that is awesome! My favorite feature is that it is oven safe. I like that it can go in the oven. I like the quick measure marks! So convenient! I like that it’s oven safe. The fact that it is oven safe is great for me. I love the solid copper core for even heating and the stainless steel that I can use to cook in the oven. For me it is really important that it is scratch resistant and oven safe! Ease of storage is always a plus, & I love that they are oven safe as well! I like that they nest. 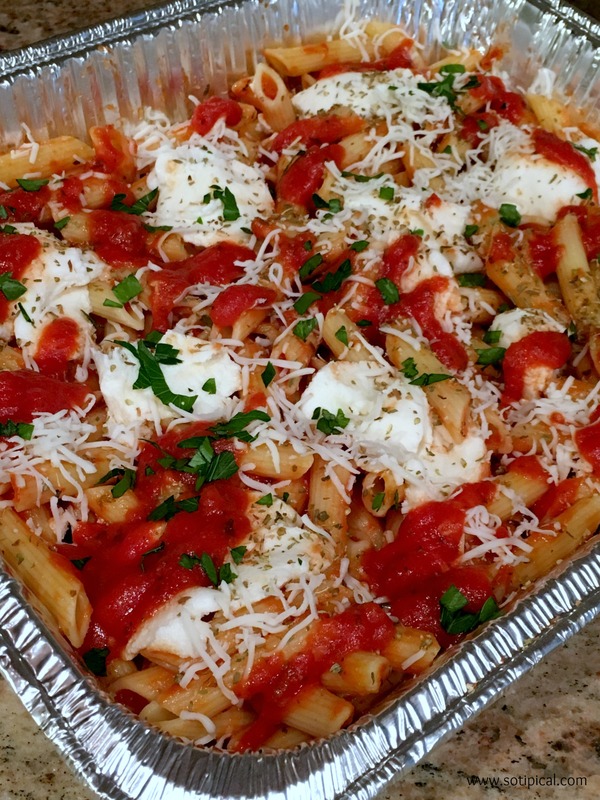 I am definitely making this ziti this weekend Great recipe!!! Does this 1 recipe feed 25 adults? I made a double portion (3 lbs of pasta) and we served 2 salads and garlic bread. This was enough to feed everyone.